Online ordering menu for Flamin Pizza & Subs. 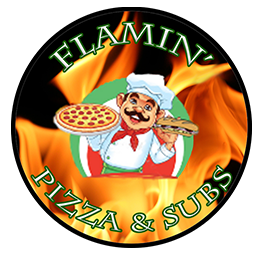 At Flamin Pizza & Subs, we pride ourselves in offering you the very best pizza, salads and sandwiches here in Frederick! Grab a slice of our tasty Buffalo Chicken Pizza or order one of our tasty burgers. Order online for carryout or delivery today! We are located on Patrick St and Hillcrest Dr, just a few minutes from Baker Park and Hood College.